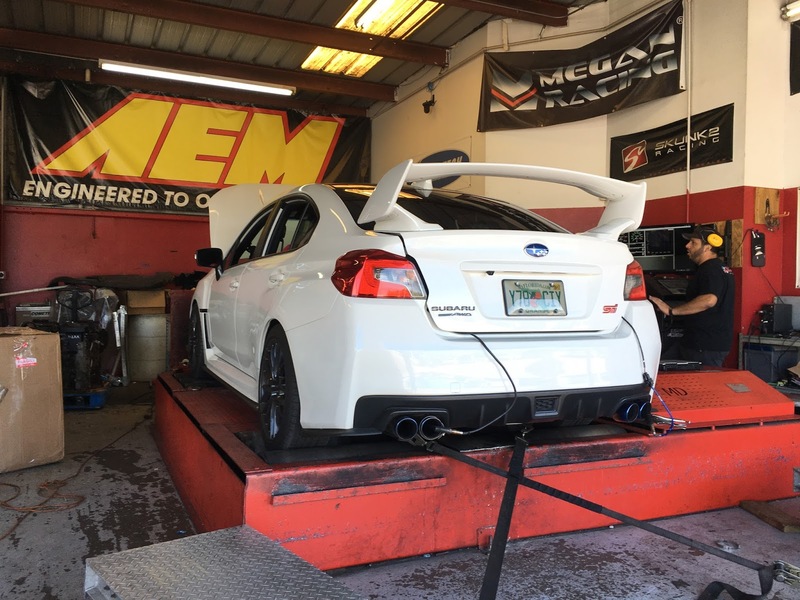 Circuit Motorsports: Flat-Out: Tuning a new 2017 STI, Clogged cats, & Found power. 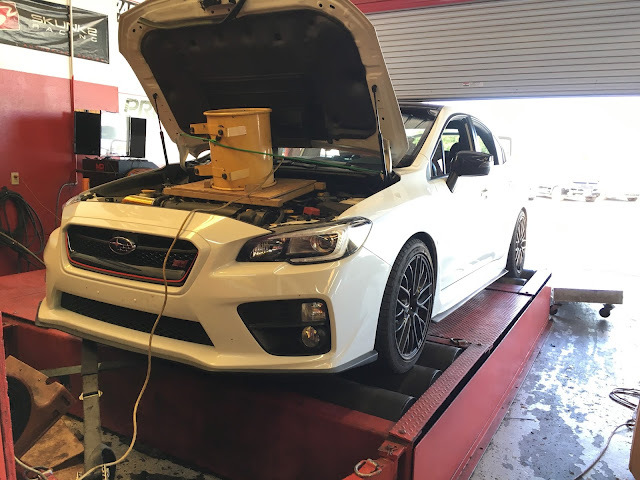 Tuning a new 2017 STI, Clogged cats, & Found power. We recently tuned a new 2017 STI for a local customer, and we ran into some issues tuning the car that we wanted to pass on to our readers. 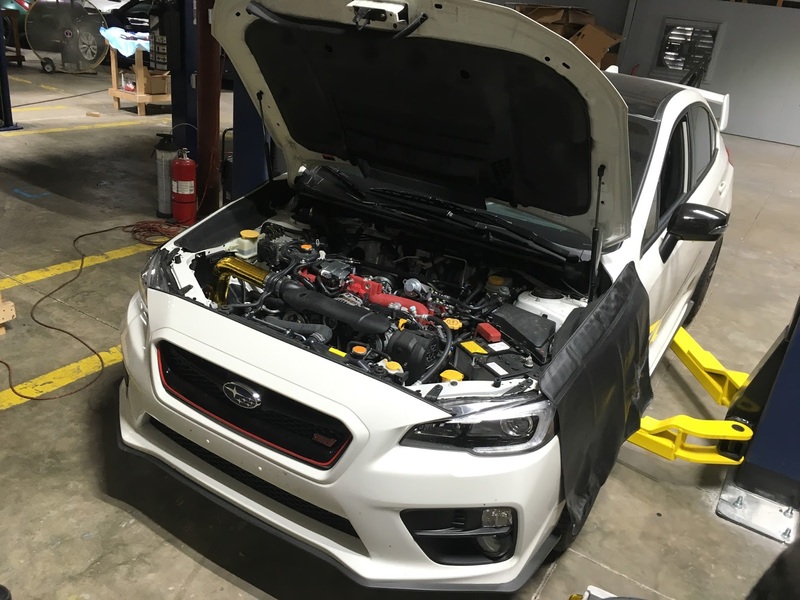 We'll be covering a problem we have seen in quite a few Subarus, and going over changes made to the 2015+ STI that makes fueling an issue with breathing mods. Read on for good tuning info! 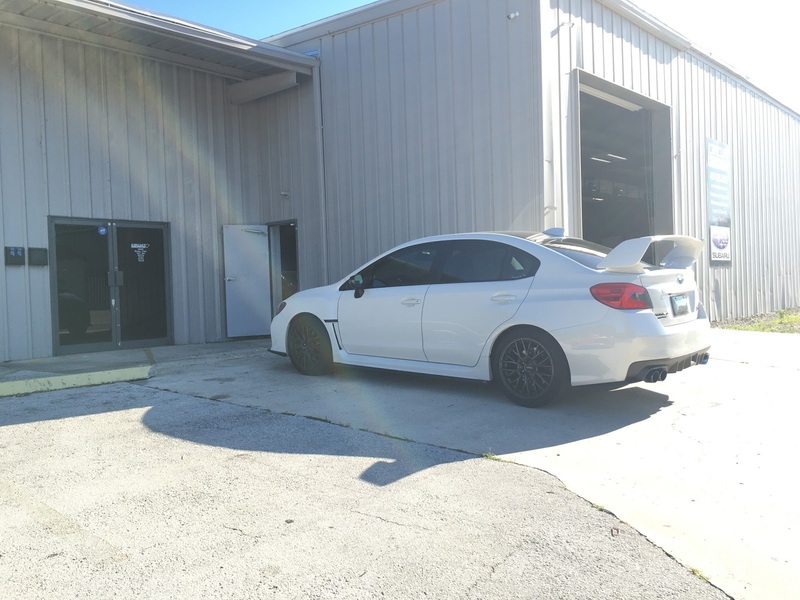 A customer of ours just bought a new 2017 STI, with very low miles. He found it at a dealership up north and decided to fly out to purchase the car and then drive it back down. The only mods on the car were a Mishimoto intake and an axleback exhaust. Our customer was concerned about driving the car all the way down with no tuning on the car and an intake, we told him he was smart and that an Accessport with a custom map made by us would be a great idea to have for the long drive. Why is that? Well, any aftermarket intake is going to change the way air flows into the turbo/engine and is metered. The factory ECU can only alter fueling a limited amount, and most times it runs out of resolution before it can make adequate fueling changes. What this means is that you will either run rich, or lean, and it is most often 'lean' with intakes. What happens when you run the engine lean? The air/fuel mixture runs too hot and this can cause Detonation. Detonation kills pistons. Dead pistons are bad, very bad. Once he got the car back down to Florida, he brought it in for us to look over and prepare for a proper dyno tune to dial the car in. We looked over the car and performed a Smoke Leak test to ensure there were no leaks in the intake or turbo system, we found a very small leak, tightened it up, and sent the car off to the dyno! 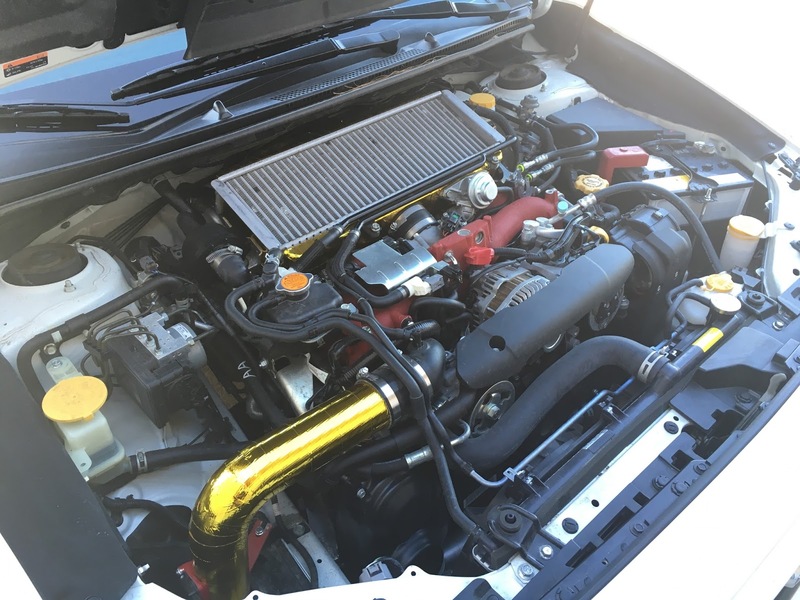 We anticipated the power numbers to be a little on the lower side using the factory downpipe and mid-pipe, but this STI just would not make power, and boost would not climb over 12-13 pounds. Our Cobb certified Protuner, Bob Rich, did all he could to get the power up, but it wouldn't budge past low 200's. AFRs and fueling looked good, but something was limiting boost, so we got it off the dyno and started looking for the issue. We took care of the easy stuff first: Checked EBCS electronics and hose routing, all was good. We removed the TMIC and checked for excessive oil buildup or obstructions and again, everything was fine. 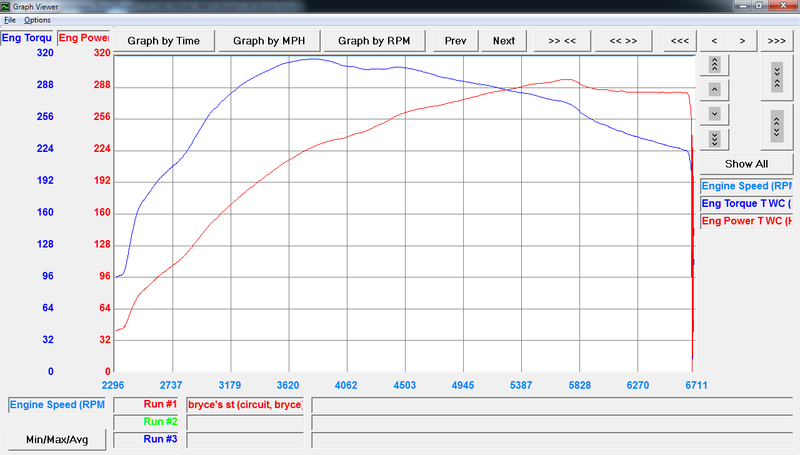 We hooked air up to the wastegate actuator and verified it worked, good there too. We swapped out the BPV (sometimes a source of a leak under boost) and the factory EBCS with known good units, and still no change. Next up we removed the stock downpipe to check for obstructions, and sure enough, the factory cat had melted and was almost totally clogged. This causes A LOT of back-pressure and does not allow the turbo to properly flow air out of the turbine side. We had found our issue, and thankfully this was an easy fix. After notifying our customer of the issue, we moved forward with a new plan: replace the clogged factory downpipe with a higher flowing aftermarket piece, heat wrap the downpipe and install a new heatshield to control engine bay temps, install a new EBCS to better control boost, and get it re-tuned for the new parts. 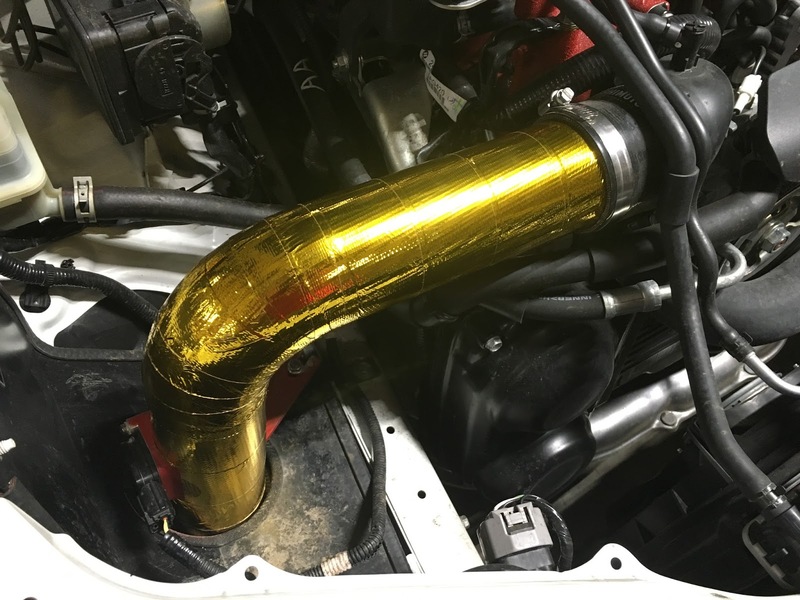 Our customer was concerned about heat so he asked us to also wrap his intake pipe and TMIC is reflective gold tape. This material is very good at reflecting away radiant heat, and keeps the intake charge cooler than it would be otherwise. 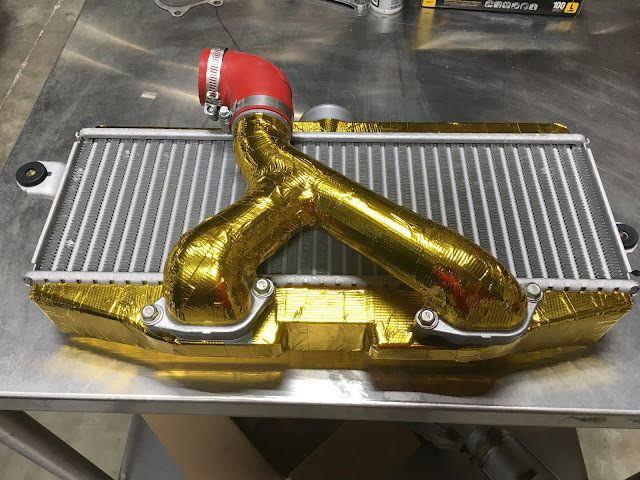 We highly recommend a heat management regimen on WRXs and STIs due to the massive amount of heat generated under the hood, so this was a very good idea! First up we used DEI Titanium heat wrap with our preferred method of wrapping and got our Invidia downpipe wrapped tight and secure. That was installed with new gaskets along with a Perrin heatshield. 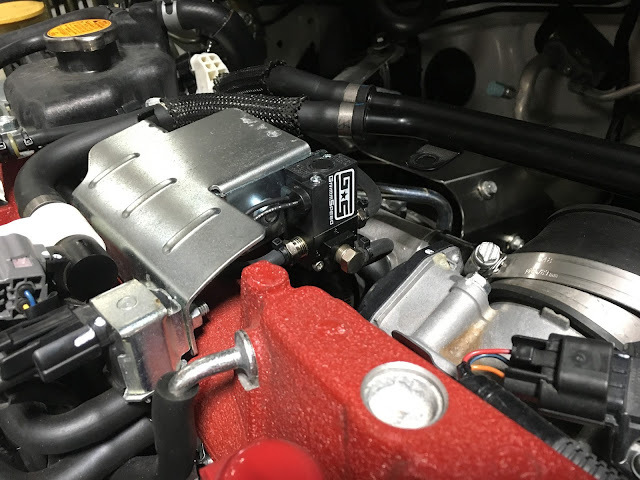 A Grimmspeed EBCS was installed and plumbed in to better control the higher boost levels this car would be seeing. Our Tech then carefully (and painstakingly) wrapped the intake air pipe, and TMIC core walls in DEI reflective gold tape. Care should be taken as this tape is not cheap, and if you do it wrong, it will just peel off and do nothing but hurt your wallet! 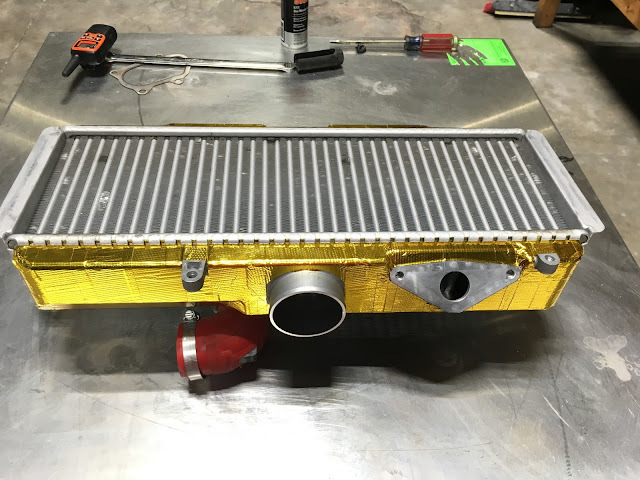 Once this was done the TMIC and intake were installed back on the car and it was strapped down to the dyno for another round of dyno-tuning. Eureka! The car tuned beautifully and made good power, 301hp & 319tq. The free flowing exhaust made all the difference and allowed the car to breathe properly. We could have made more power but the 2015+ STIs run out of fuel (injectors) before the turbo runs out of steam, so boost needs to be tightly controlled so as not to overwork the injectors and cause a potential failure. This is a very important item to note for anyone looking to have their 2015+ STI tuned, you will need to be sure your tuner knows to limit fueling and boost to keep Injector duty cycles around the 80% mark, otherwise you cannot accurately control fuel delivery and risk overheating an injector causing it to fail. This will lead to a damaged or blown engine, and an expensive repair! 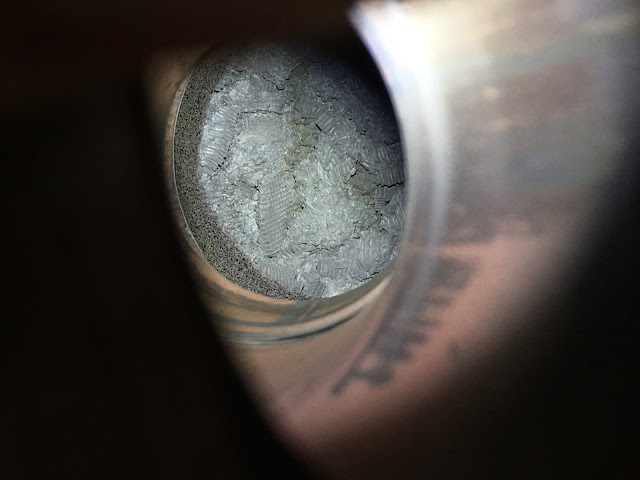 So if you have a catalytic converter in your car, and you are experiencing issues as listed above, be sure to have that on your list of items to check. OEM cats are known to fail on modified cars, as they can't withstand the additional EGTs or the richness of the AFRs on a tuned/modified car etc.